Hollywood to voice actors: The guy from The Love Guru outranks you. | Critical End! And most important to me, Dan Aykroyd is not a voice actor. Voice actors are a talented breed. Daws Butler made Yogi and a ton of other Hanna Barbera characters the cultural icons they are today. Since his death, a select group of voice professionals, many trained by Butler himself, have stepped forward to keep his characters alive. So now that Yogi’s going all big budget, it seems unfair to rob a working voice actor of the payday by giving the role to a semi-retired purveyor of magic skull vodka. No offense, Dan. But it’s certainly not the most egregious offense ever levied against our golden-throated brethren. After all, Yogi hasn’t really had a regular voice since Greg Burson stopped working in 2004 (Google that for a truly sad tale), so recasting the part doesn’t hurt any one specific artist. "This makes me very angry. Very angry indeed." Yes, a man who is already immeasurably rich is going to get the keys to another dump truck full of money in exchange for what will very likely be a terrible, unresearched imitation of Mel Blanc, while Joe Alaskey–easily one of the most talented voice actors working today–continues to toil in relative obscurity. Or, more likely and more insulting, Alaskey will end up doing one of the movie’s disposable bit characters while Myers ham-tonguedly mars (Get it? 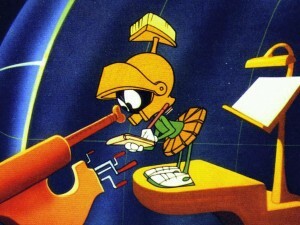 Mars?) Marvin’s legacy. Their love didn't follow the rules...of space. Look. Some of the most recognizable (and lucrative) characters in the world are cartoons. Yet, Hollywood continues to treat the performers who bring them to life like second class citizens. 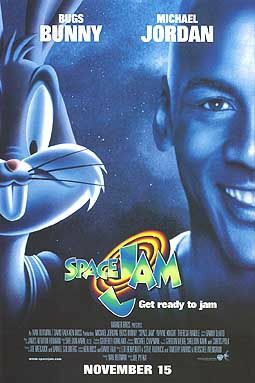 Take a look at any poster for Space Jam (WARNING: Do not take a look at the movie Space Jam.) You’ll see that the top-billed stars are Michael Jordan and Bugs Bunny. Oh, I’m sorry! Bugs Bunny and Michael Jordan. So why is it that when the movie premiered, Michael was led into the prestigious Grauman’s Chinese Theatre, while Billy West and the rest of the voice cast were shunted into an entirely separate screening. I mean, I get that Jordan is going to get the press attention, but were they afraid he might accidentally catch some talent if he spent 90 minutes in the same room with a voice actor? This entry was posted on Thursday, December 24th, 2009 at 12:33 pmand is filed under . You can follow any responses to this entry through the RSS 2.0 feed. Both comments and pings are currently closed.